I swear, my workplace is such a bad influence on my wallet. There is another makeup sale going on and I just couldn't resist!! Here's a quick haul of what I purchased last Saturday night after work. I usually don't use face wipes to removed my makeup since it tends to dry out my skin, but it was 'buy one get one free'! And Maybelline was having a 'two for $15' sale on eye products so I bought couple of the Color Tattoo eye shadows that I have always wanted to try, and repurchased my favourite liquid liner Master Precise and a new Hyper Glossy liquid liner. As I always do before a makeup purchase, I had to convince myself that this was a rare opportunity, and I abused this awesome deal like a mad woman. Because...I will eventually need them... right? Right?? Ok, enough with my silly rant (& excuses). Let's get on to ze swatches! The Maybelline New York Color Tattoo By Eyestudio retails for around $12 AUD each here in Australia (now you know why I went berserk with the two for $15 deal!). 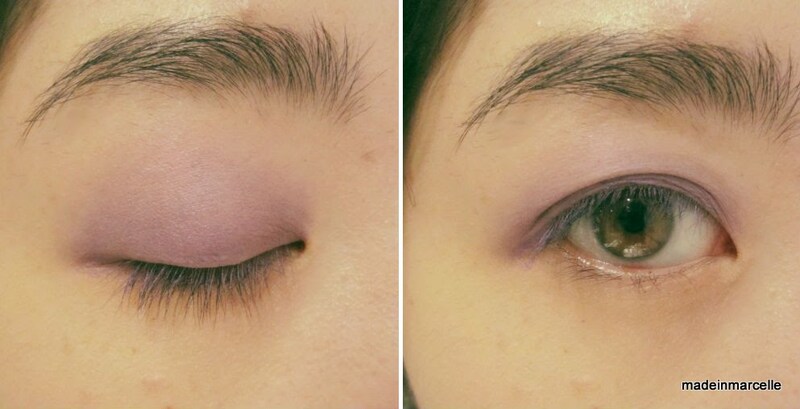 They're cream gel eyeshadows which are meant to be long lasting. There are 10 shades available and I purchased four of them - Painted Purple, Bold Gold, Edgy Emerald, and Pomegranate Punk. From top left clockwise: 20 Painted Purple, 45 Bold Gold, 30 Pomegranate Punk, and 50 Edgy Emerald. When I was swatching these, I noticed that they're not as opaque as I expected. They are true to the colour seen in the pot, but tend to be sheer, unless multiple layers are applied. They apply creamy yet thick and it does take a little effort to spread and blend, otherwise it sets pretty quickly and does not budge afterwards. I like how you can build on the intensity of the colours by letting the previous layer dry & set, then adding on more layers. Testing it under running tap water for about 10 seconds. Still looks the same! After smudging the centre region with my fingers with force. Not bad, considering I won't be smudging my eyes with the same amount of force...ever (hopefully). 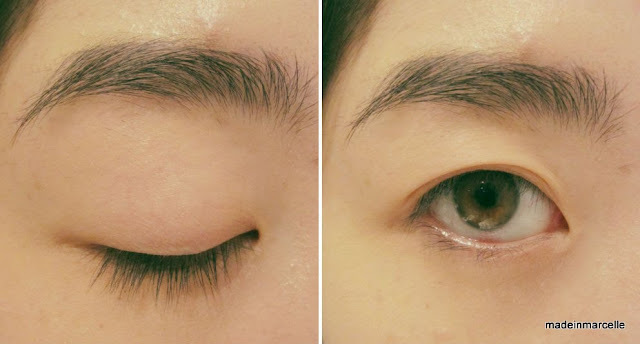 I was concerned that these would be difficult to remove (aftter all, they are "tattoos" :P), but to my surprise they came off easily with the help of some eye makeup remover. Now let's try them on my eyes! 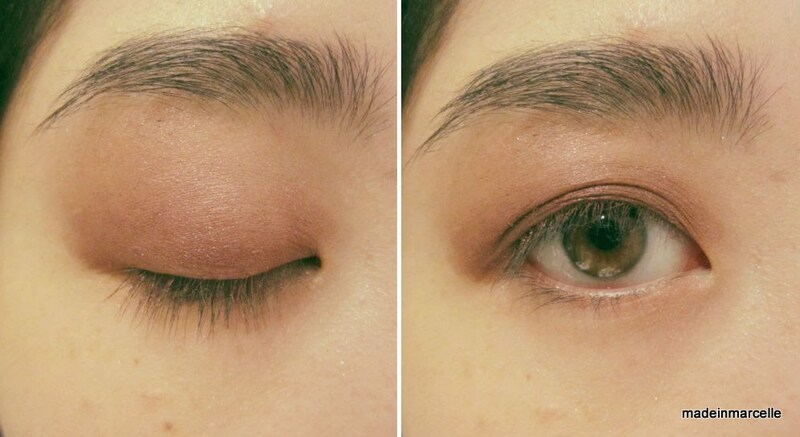 Clean slate of eyes, ready to swatchy-swatch! Out of the four, I would have to pick Painted Purple as my favourite shade. It is wearable for an everyday look yet has an edge to it. For a more natural look, I would go with the Pomegranate Punk which is a coppery brown. 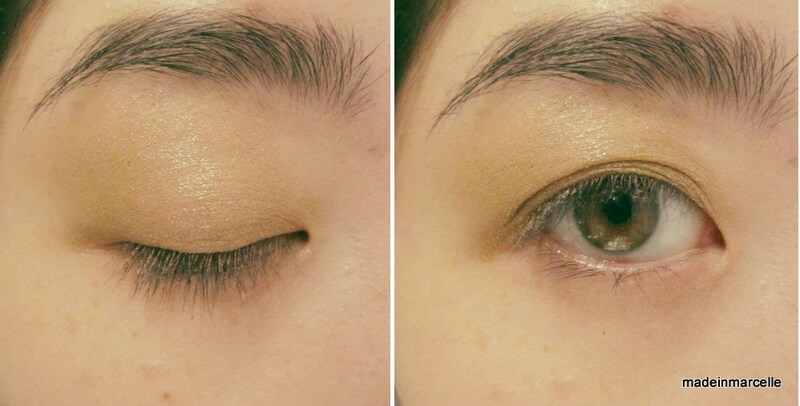 The best colour pay-off has to be Bold Gold, which is the only one I didn't have to apply multiple layers. 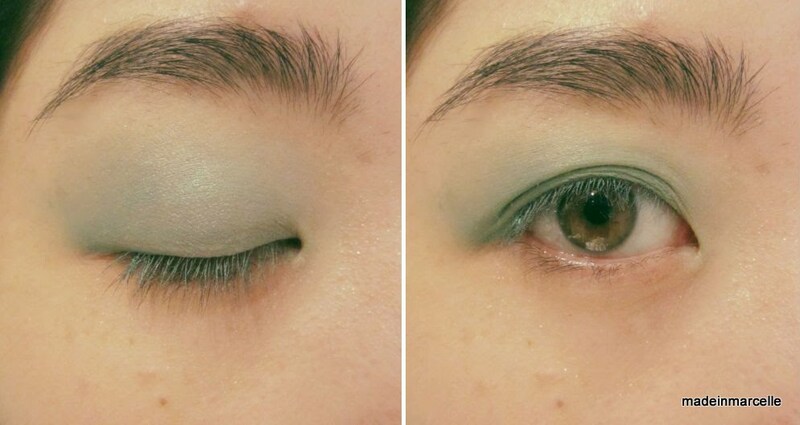 And lastly with Edgy Emerald, I will probably utilise it as an eye liner. I'm so excited to add these to my never-ending collection of makeup. I will defintiely be creating both wearable & funky looks with these new toys as well as do a proper review noting especially on their staying power, so don't forget to check them out too. 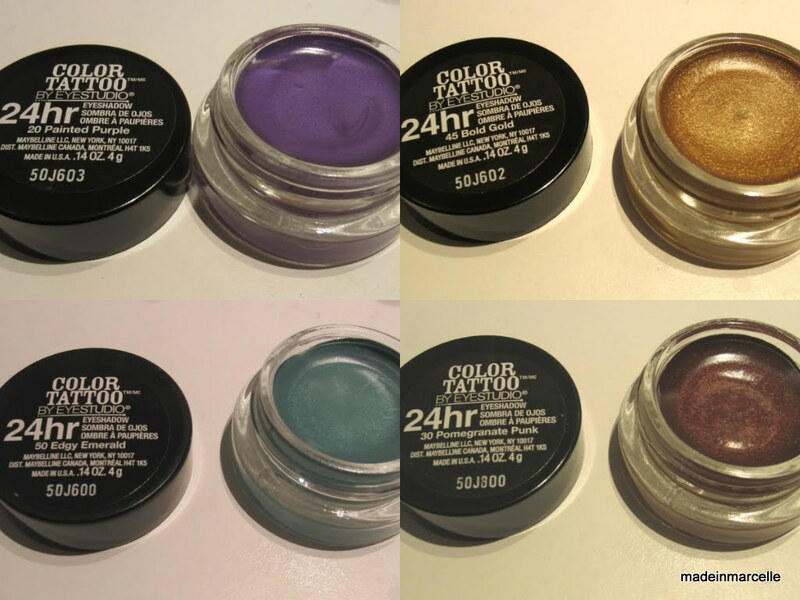 Do you own any of the Maybelline Color Tattoo eyeshadows? If so, which shades do you own and what are your thoughts on them? I would love to hear what you guys think. Haha glad you did :) I hope you love it too!